A beach front property is a dream for anyone buying or building a new home. If you find a site or home for sale that is within your budget, it is important that you carry out relevant due diligence and invest time in weighing up the pros and cons of a particular location. What do you know about your preferred location? For both new builds and buying a home near the beach, the site is an important factor to consider. Are there any issues surrounding structural integrity? Is the ocean driven weather in the region likely to impact maintaining the property? These are important questions to ask – especially in areas where sites or properties are available at a bargain. Make sure you thoroughly carry out research on the location of your build or potential property before committing to a move. It is especially advisable to ask a building surveyor to make a full flood risk report when buying or building a seaside home. There is a distinct difference between homes that are built near the beach and those that are literally on the beach. The weather conditions which are a factor for oceanfront properties may not have the same impact on properties that are half a mile away. For instance, ocean spray and sunlight will directly affect homes that are closer to the waterline. These properties will require more frequent maintenance to repair damage from the corrosive elements of nature. 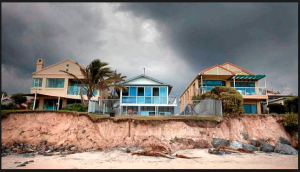 If the property is nestled among taller buildings you will be sacrificing the beachfront view but will benefit from the added protection from surrounding properties. Are you settling down for life or would you prefer a property that will allow for expansion in the future? It is important question to ask because your chosen site or property may not leave much room for improvements. This is especially true of sites or properties that are located directly on the beachfront. When choosing a site or home for sale it is important to have the right inspections carried out for both your present and future needs. A land surveyor can help you determine whether a site is right for you, whereas a building inspector will provide reports on the stages of a new build or condition of an existing property. Of course, if you are planning on moving close to the beach you may be considering activities such as swimming or surfing. Like anywhere on the Australian coast, there are stretches of beach in New South Wales where the ocean conditions are potentially hazardous and it is a good idea to research the safety rating of the particular stretch of beach where you are considering setting up home. At Houspect we welcome you to consult with out expert team for all your building inspection needs. If you are considering pursuing a dream home beside the ocean, contact our New South Wales offices on 1300 258 789 to find out how we can help you turn your dream into a reality.